I recently visited Osaka castle wanting to see some sakura but sadly the storm had blown all the blossoms away. 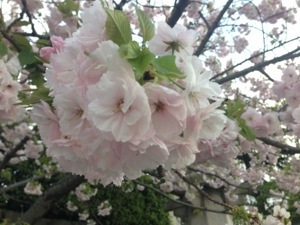 However, I did found this one tree of Yae-Zakura that was still full of blossoms. This type of sakura is just truly beautiful! Definitely worthwhile to see. I have read somewhere before that it used to be found only in Nara prefecture and mostly up on Yoshino (吉野) mountain where you can go up by rope way to view the whole mountain full of beautiful cherry blossoms. But these days, it seems to be found everywhere. I also found some information about where to see Yae-Zakura in Osaka. Apparently, there are some exhibitions and places to see this particular type of sakura. Yae-zakura blooms a bit later than the normal sakura and the exhibition is only opened to public officially when they are in full bloom. 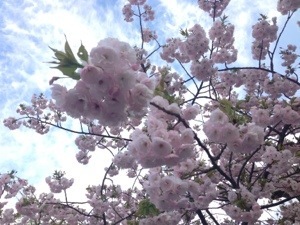 The hanami may have been over but Yae-zakura is still here! Where to see: Japan Mint – Osaka Head Office. This organization is an Incorporated Administrative Agency where coins, medals, metallic art objects and others are produced. You can visit the factory and see the facilities and how the objects are produced. This sounds a bit strange as a place to display Yae-zakura but the special thing about this place is not the metallic objects they produce but the fact that it has so many Yae-Zakura trees inside the place. Double Cherry Blossom all the way!